Since this might be helpful for a wider audience of Garmin Connect Users having trouble getting their proper activity RSS feed, I decided to write yet another blog post. So if you are reading this, you might have wondered: Why is the provided Garmin Connect RSS not working? Well, to make a long story short: They screwed it. And over at Garmin, they did not bother to work on that problem for almost 3 years now! But I will show you, how easy it is to fix that. I updated this article by October 17th, 2014 to give more hints on troubleshooting and the conditions why some activities will be shown in your RSS feed and some won’t. In the title bar of your recent activities, there’s the significant RSS icon, which is supposed to link to a RSS feed of your public Garmin Connect activities. The link to the RSS feed is automtically generated. But this automatism is poorly programmed, so the resulting feed URL is wrong. To get the proper feed URL, you will have to tweak the URL a bit. But don’t be afraid, it’s very easy. USERNAME is the placeholder for your username. Just viewing this feed URL, even a beginning web developer will see, that there’s a problem with the feed URL: It uses special characters. And from a web developing or programming point of view – that is bad work. But I’ll refuse to add further comments on this, since that is not the only poor work and not the worst thing on Garmin Connect. Also the “feedname” value is actually not relevant. It’s just for the feed’s title. Anything you’ll name it, it becomes the feed’s title. To get the corresponding and a working feed URL, you’ll have to replace the special characters with some %20s. The %20 in URLing (if you might call it that) symbolizes a blank space. As I said above: no further comments on this. Instead of “%20” you could simply use a “+” symbol. It also enters a space into the feed’s title. To get your feed URL, use your individual USERNAME. Activities with certain setting are not shown in your RSS feed. The most important one is the privacy setting. Private activities and activities only visible to your connections won’t be pushed to the RSS feed. But there are some more options, that will prevent the activities from being pushed to the Garmin Connect RSS feed. 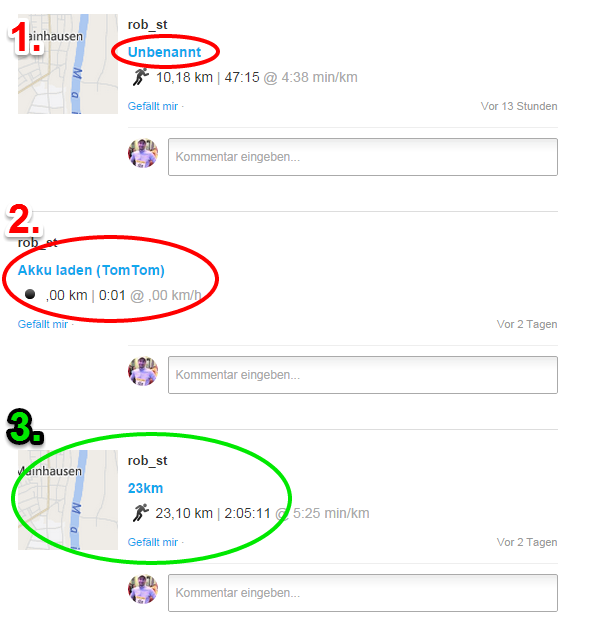 I’ll try to explain it with a screenshot of my activity-feed on Garmin Connect. Some activities will not show up in your Garmin Connect RSS feed. Make sure, your activities’ privacy settings are set to “visible to all”. This activity is not pushed to the RSS feed, because it has no name. After uploading an activity, you should edit it and give it a name. Which one you choose, doesn’t matter – as long as it is not unnamed. This activity will not show up because it doesn’t have a map. There’s no workaround to this. Activities without map will never find their way to Garmin Connect’s RSS feed. This activity is fine. It has a name, it has a map and it’s visible for all. So this one will show in the RSS feed. The RSS feed takes a while to show new activities. You’ll probably have to wait for half a day or even more, until new activities will show up here. It seems that Garmin has tweaked on thei RSS service. As I found out today, my personal RSS feed hasn’t had any new activities later than January 5th, 2015. Maybe I’ll go into that one day, but I won’t promise. This entry was posted in Something else and tagged Garmin, Garmin Connect, RSS. Bookmark the permalink. ich kann leider nicht sehen, wie die genaue Feed Adresse ist. Können Sie die vielleicht hier noch einmal in den Kommentaren posten? 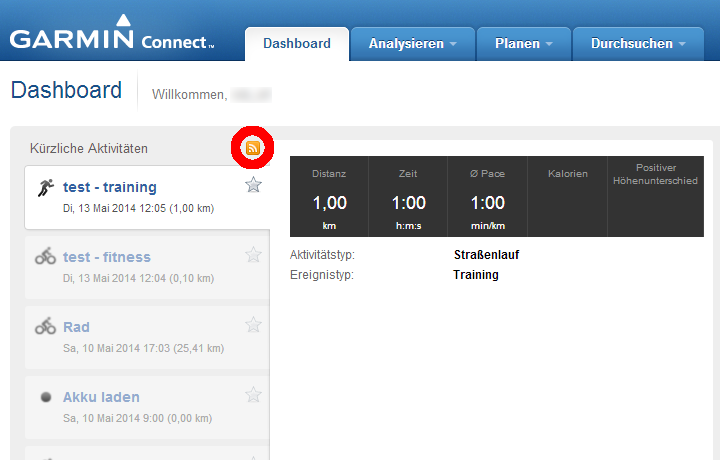 http://connect.garmin.com/api/activity-search/component/feed/rss.faces?feedname=ANYTHING&owner=USERNAME für das “moderne” Garmin Connect. Hi there. Thanks for taking on this subject and my apologies for not asking in German. I have shared this article but can’t see what a properly formatted Garmin Connect RSS feed should look like. I would find that very helpful since I’m still having difficulty after replacing the special characters with spaces. But perhaps I’m not understanding something important. Hi Paul. Thank you for your comment. I’ll have a look at this and will come back to it tonight. seems as if Garmin had discontinued their RSS service. I haven’t had any new activities in my RSS feed later than January 5th, 2015.